​Valentine's Date Night is an affordable night out for a great cause! You are invited to an evening celebrating LOVE in all its wonderful, frustrating, and hilarious glory! Shows run FEB 9-10 & FEB 16-17 at 7:30 pm. Tickets are $20 and include a scrumptious intermission dessert buffet. All proceeds go to support the McFarland Food Pantry – so far the Valentine’s benefits have raised nearly $40,000! 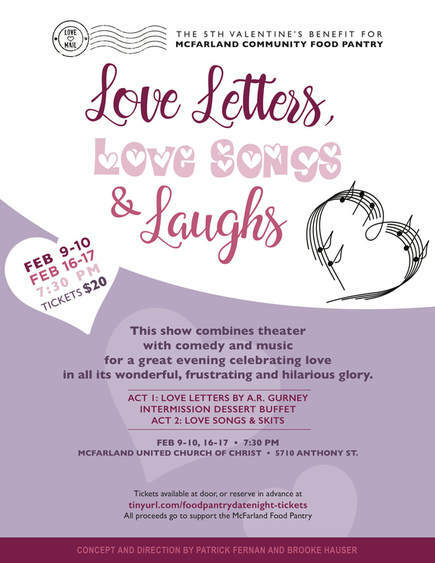 This year’s show will begin with the play, Love Letters by A.R. Gurney. The play was nominated for a Pulitzer Prize and has been performed by the likes of Carol Burnett, Kathleen Turner, Jane Curtin and Elizabeth McGovern as the woman and William Hurt, Christopher Reeve, Christopher Walken and Jeff Daniels have played the man. None of them will be in McFarland but you do get Brooke Hauser and Patrick Fernan as two friends who share a series of letters that stretch across the decades. After the dessert buffet (seriously awesome), Act 2 will feature wonderful music and a very short, hysterical play about a first meeting that goes horribly awry…over and over again. We are excited to welcome new and returning professional performers volunteering their time to this great cause.